This book covers 5th and 6th grade mathematics including . . . The answers are included in the textbook. 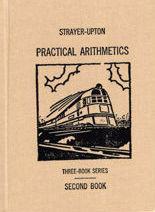 Complete this book and you are ready for Strayer Upton Practical Arithmetic Book Three. Strayer Upton Practical Arithmetic Book Two is a hardcover textbook containing 495 pages plus answer pages. This book is not consumable. All answers are written on separate paper or in a notebook. It is designed to be read by the student. Strayer-Upton Math Book Two contains two years worth of lessons covering 5th and 6th grade math.